In this lesson, we will learn how to construct and identify a matrix by using the relation between its elements (entries) and their order (element location). Which of the following is the matrix 𝐴 =  𝑎  𝑖 𝑗 , where 𝑖 = 1 and 𝑗 = 1 , 2 ? Find the matrix 𝐴 =  𝑎  𝑥 𝑦 , with an order of 3 × 3 , whose elements are given by the formula 𝑎 = 5 𝑥 + 4 𝑦 𝑥 𝑦 . 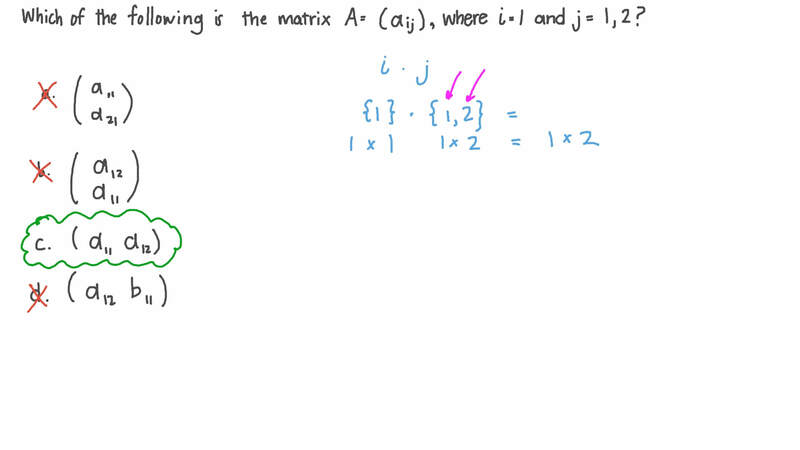 Given that 𝐴 =  𝑎  𝑖 𝑗 where 𝑎 = 3 𝑖 + 5 𝑗 + 9 𝑖 𝑗 , find the matrix 𝐴 𝑇 . Which of the following is the matrix 𝐴 =  𝑎  𝑖 𝑗 , where 𝑖 = 1 , 2 and 𝑗 = 1 , 2 , 3 ?